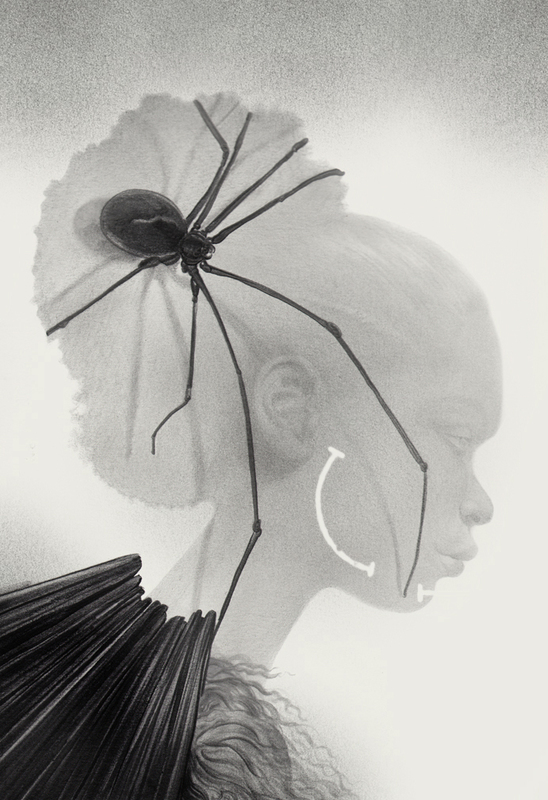 Unused original approach to AKATA WARRIOR, graphite on paper. It was seen as too-spidery by all. 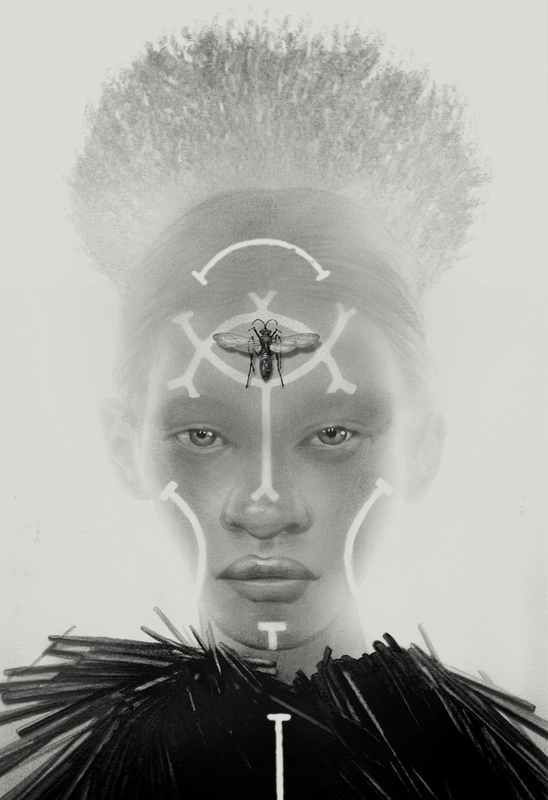 To continue with what is for me personally one of the most challenging and exciting exercises in book cover making, I was tasked with doing covers for the paperback version of Nnedi Okorafor's AKATA WITCH and the hard and softcover editions of AKATA WARRIOR. When I had initially tackled the Cross Cult translations of LAGOON, BOOK OF THE PHOENIX & WHO FEARS DEATH we had talked about just continuing their tradition of portraits of these powerful women whether they were to be used for a book or not simply of the art of it... but she managed to work some magic into tackling these latest with my pal and AD at Penguin, Jim Hoover and make these official. One of the most essential truths in art, at least by my reckoning, is that art in its noble and pure form is definitively un-racist. Not that it hasn't been or will not continued to be used to promote racial agendas both good and bad- I mean that the act of making art- the act of seeing is removed from the social judgements and cultural realities that come later. Art is objectification at it's most pure- it turns or sees people places and subjects as objects from an observational standpoint. So when you are tackling something racial or depicting someone from another tribe be it a Maori warrior, a Swedish businessman, or an ancient Hun, leaning hard on this aspect of art-making can be a tremendous help as a starting point. It affords you to see and study the physical characteristics of the subject without importing your own b.s., from which is where you will either make a bold/progressive statement or do something dumb. So observe, study and analyze as if you were an alien visiting this subject. Try to see it all as new, make no presumptions or take anything for granted. Recognize the inherent narcissism we all delve in that causes us to make pictures of other humans look a bit like us, and keep it in check. Be conscious of your own corner-cutting, and submit to the the demands of research and study. They won't save you from every error, but they can steer you clear of most of the sharpest stones. My origins and personal experiences with race, my nearly all white childhood and the reversal of that in NYC and coming into the adult world at a time where white cultural dominance was ebbing and we were seeing much more diverse and colorful faces in our culture, made this an interesting issue to take on. Much in the same way it was when I took on INDEH, the same questions arise: Should I be doing this? Should I not be? Why and why not? etc... From a purist art standpoint I find that the medium and practice of art is exactly the perfect place to take on what might be politically/socially controversial subjects because art is inherently neutral and objective in how it sees and envisions thew world. It's a place where we stuck on the earth can elevate our own predispositions towards each other and create circumstances for being changed in a backdoor way to how we interact and view our world. To me that's where art is its most valuable to the culture within which it exists and speaks to. So for me personally on this one I had to question my own inherent eyes and racial awareness, discard much of it and start again from a new place in order to see it. Sunny made this easy because who she is as a character made it unavoidable: She is a light skinned albino Nigerian woman. This means learning that in her case, her race or cultural identity had literally nothing to do with her skin color. This means it has to be about her as a structure, and her as a character. It can't just be a picture of a woman, it has to BE Sunny. 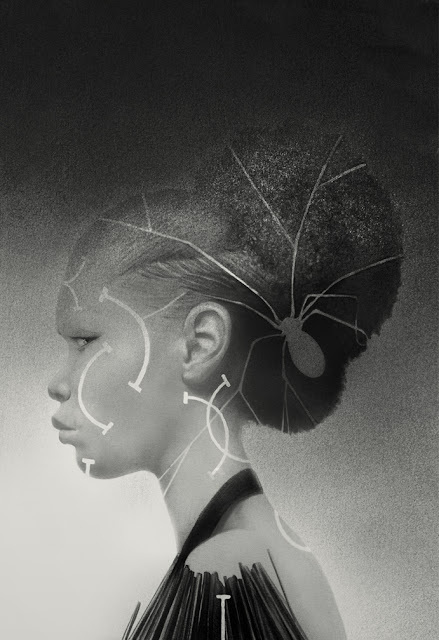 The most essential and primary testament is when the Nnedi looks at it and SEES Sunny there looking back. Once that's achieved, the rest is about design and making the cover function to its best ability in how it sells interest in the story behind it. So I operated from this goal first, crafting her in graphite and sharing the image with the author as well as my AD. 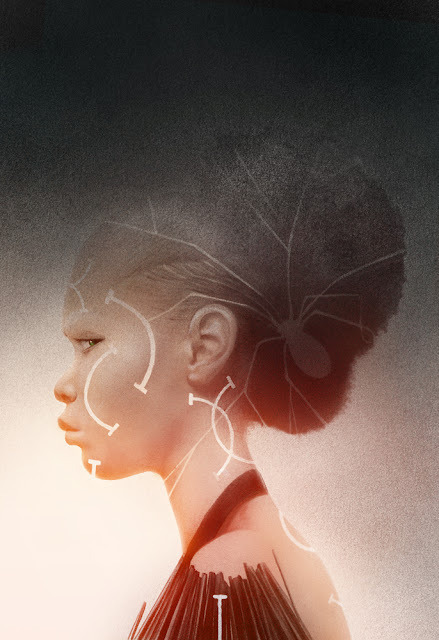 Nnedi and I interact largely on the subject of making sure she's who she needs to be. This is more about not getting stuff wrong than it is about achieving anything at all. Jim Hoover, my AD on this, brings int he practicalities of it as a cover and what they need that cover to do- hit the right audience age and etc..., fulfill the advertising requirements a book cover has to meet, and satisfy the marketing and publicity ends of the publisher so we can threads through it all both a piece we respect like and want to look at, and also one that checks all the right boxes. Once this is achieved it's off to the color races and finalizing those and applying any remaining tweaks so we can put it to bed and do it again. We often in art mistake race for color, and what this taught me was a way to skip past those initial assumptions and get right to the heart of her structure rather than her tone. This meant a lot of research into what physical features are distinctively Nigerian, and bringing those to bear on this young woman. She had to, without leaning on skin color, be authentically Nigerian and herself as a true native of her culture in every bit as much the same way in which I might need to address and accomplish the same for a Cambodian scientist, or an Icelandic luthier. We all within our tribes carry specific physical marks that stem from our localized familial genetics. Folks of a Rwandan Tutsi heritage have different physical features even from Rwandan Hutu people due to the way we as people form our tribes via family and region. Whether or not my own self-aware whiteness drove me to paying especial attention to these subtle but significant differences, or whether it was just about cleaving close to that aforementioned ethic of art making to be its best and truly objective self, I can't say. But I do confess to feeling as someone coming from a different cultural experience, I owe a lot to research as a means to be the best scribe for the cultural truths and realities of one that is not mine. That means, int he case of INDEH, years of research, tracking tribal origins, genetic traits and societal issues so that the Apaches look like Apaches, especially to actual real Apaches. If I had done this first as part of this ongoing series, I am not sure I would have been able to if I were being honest. I think I needed to do the other three to fully grok what it was this pair of images needed to have done. It was entirely essential to this potential hubris that Nnedi had been so excited about the previous three- and particularly to have been so spot on with them both culturally and inherent in her mind to the characters as she see saw them. Her words brought great comfort to me in times of doubt- (Thanks Nnedi!). So back to it- the first and foremost thing was herself as a person and a character different from the other three that preceded her. Sunny is a person and I need to find that person. So I just began by drawing her. Next up was making sure her features where both age appropriate, (she was originally drawn too old in my opinion), and tweak her later so that she read as unique. We all as artists tend towards the same faces, and more often than not I have found, towards faces that either resemble our own, or those we were familiar with growing up. I grew up surrounded by a lot of white faces, and as a child almost exclusively so. Being aware of that slant in how I see and draw people is essential to be able to then work around when depicting others is called for, and when it is not. For these, I had to go outside of my comfort zone and wheelhouse. (For my next book with Ethan, as an example, which takes place in Huntsville, Texas, its all about white folk given the area so much less so). So I had to check my own initial character depictions against research of her locale and country as if she were an actual real person from that place. That meant looking at noses, eyes, ears gait, hair and all the rest of the little details that makes her seem as real and possible to a Nigerian as not. The same work is required no matter the area or region, and often even race. I bring you back to the physiological differences within Rwandans whether Tutsi or Hutu or both. They are there and they do matter. Even if you are some fellow from Baltimore who has no idea of either, the work and research will come through and affirm your art even if much of its researched details only do so as a sub-rosa event. The work you do will show through always, so I encourage you as artists to do the work. And this is the whole point of it all in the end... we're all racial, we're all tribal. We come from different regions and different places and we see the world informed by those inherent locales. It is our job as artists to both be aware of that reality and to look beyond it when we can, not just when the job requires. It grows us from ourselves and makes of us better at what we do both as artists in our art and as people walking down the street. The great personal side benefit of this particularly racial last few years of mine, whether its doing some of the crazily controversial racial work that infuses Walter Mosely's terrifically poignant science fiction stories, all the thorns inherent to tackling INDEH or the immensely informed work that went into Nnedi's covers, is that I go into 2017 with a much wider vision of the world, my job and my own capabilities as an artist in the jobs yet to come. I have already tackled two new native based covers- concerning a Mohawk story for Abrams and one for Tor for a luminously dark novel involving traditional Fancy Dancers. I could not have done these without having become battered and steeped in the culture and inherent trickiness of those arenas, and I am a better artist for it. So I encourage you all as we march into an ever more closely connected racially diverse world that we (thankfully) live in, to get out there and draw outside of your boundaries and tribes and neighborhoods if for no other reason than how it will widen your own chops as an artist. Know you will get it wrong before you find out how to get it right. Know you may have to unlearn some ways in which you presumptively see. Know that at the end of the day, getting it wrong won't cost anyone their life, and it just means you need to get better at finding a new and innovative approach. You will have to discard a lot of hangups and social issues while working, advice and input from friends and colleagues as well. You alone must chart your best way towards seeing your subjects at their most essential and you alone have to get right with your own limited and prejudicial ways in which you see the world. Because you do, as we all do. It's how we grow up and learn to cope, but it's part of us and not to be made into an enemy. Just recognize it make it part of how you choose to make a mark and what for rather than revealing itself at inopportune times. And who knows? You might find it makes you racially more aware and broader in your ranger of how you see people and the world by accident. I know it has done this in droves for me, and part of what has allowed me as an artist to justify continuing in this path. I would be a lesser person and lesser artist if I didn't take these risks, and stayed within my own comfortable confines. It may be spooky and it may get you into trouble from time to time but I really believe if you pay attention, be artistically objectifying when needed... you'll come out the other side better for it, and your work will take you places you never expected. At the end of it all as we close out this intense 2016, this is the real goal. The individual pieces are all just bricks in the road. Evidence of the learning. Hope everyone has a terrific holiday and an even better 2017!